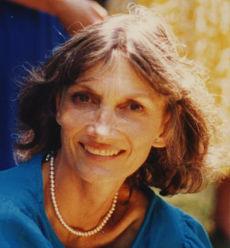 Joya Marie Wells, age 85, of Santa Barbara, passed peacefully on February 10th, 2016 at Serenity House surrounded by her family. Joya (Agnes Bogan) was born in Santa Barbara to Dr. Alfred and Helen Bogan on February 17th, 1930. She was the younger sister of Al and Louie Bogan. She lived in both Santa Barbara and Pasadena in her childhood and graduated from the Montecito School for Girls (currently Casa Dorinda). She attended Smith College in Massachusetts until her marriage to Edgar (Terry) Wells, Jr. In the early years of their marriage, she lived in many locations including Virginia, South Carolina, and Massachusetts. The family returned to her hometown of Santa Barbara in 1959, where she raised her three children. In her younger years, Joya was a devoted mother, actively involved with her children. She enjoyed playing tennis, and loved to walk the beaches and foothills of Montecito. In her 50s, Joya followed her passion for art and moved to northern California where she earned a second Bachelor’s degree in Fine Arts at UC Santa Cruz. She was an artist in the Bay Area for a decade, showing her works in watercolor, oil painting, sketches, mixed media, and sculpture. She was an activist for peace, anti-nuclear efforts, and environmental protection. In 1994, she returned to Santa Barbara to be closer to her family. Joya loved spending time with her grandchildren; singing songs, taking walks, and encouraging them in their activities. In her recent years, she began writing stories of memorable events in her life. She leaves behind many humorous limericks, jars of water washed beach glass, and lasting memories of her free spirit and optimistic outlook towards life. She is survived by her three children, Kristie of Los Osos, Michael (Kathleen) of Solana Beach and Las Vegas, and Leslie (Mark) of Santa Barbara; and four grandchildren, Nicholas, Elizabeth, Skylar and Shea. The family would like to thank the residents and staff at Wood Glen Hall for their friendship and caring over the last several years. A private celebration will be held in her memory.